Toto Wolff has warned Lewis Hamilton and Nico Rosberg that Mercedes won't hesitate to make an "unpopular call" and "manage them more" if they feel a victory is at risk. There tension in the Merc camp threatened to boil over again at the Chinese Grand Prix after Rosberg accused his team-mate of gamesmanship, which he believed put him at risk of being overtaken by the Ferraris of Sebastian Vettel and Kimi Raikkonen. The German felt Hamilton backed up the field unnecessary, but the defending World Champion hit back and said Rosberg wasn't really putting enough pressure on him in P1, saying "if I was in second, or third, I would have done everything. I wouldn’t have sat back two seconds to make it to the end of the stint". Although both drivers have since calmed down, Mercedes motorsport boss Wolff has made it clear they won't "risk losing a race". "It may be if we are risking a win against Ferrari we would make an unpopular call, not to freeze everything, but manage them more," he told Press Association Sport. "Our number one objective, which is what we have decided with the drivers, is we have a big responsibility to the team and the brand. "It's not just about those two guys – it's about the thousand people working on those cars. "If it gets to the point where we have to interfere between the two of them because we risk losing a race win, then we would do that. "We don't have the gap that we did last year where we can just let them push each other until the very end. We need to manage the gaps." 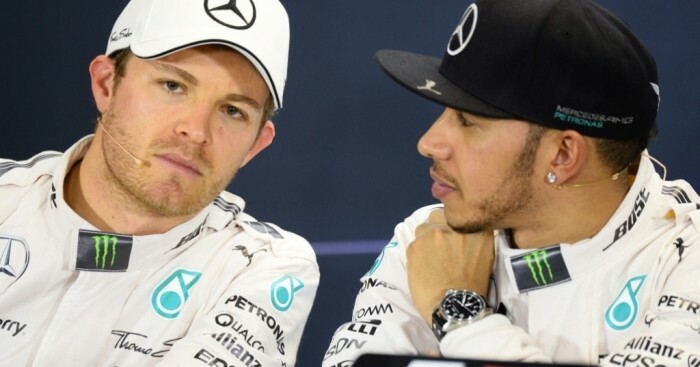 This isn't the first public spat between Hamilton and Rosberg as the duo also had a go at each other in Bahrain last year and despite threats to implement team orders after that incident, Merc also "managed" the situation. Wolff says they are not in favour of going down the team orders route. "We have seen in the past a clear team order that has stated 'you are not allowed to overtake' even though the driver behind may be faster, for example," he said. "This is not something I can honestly see happening. "I can understand why teams in the past have done it because they were under threat of losing a Championship. "Knock on wood, we haven't been in that situation. But managing the situation more, without making such a drastic call, is a possibility now."